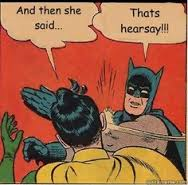 This entry was posted in EVIDENCE, Fool-Proof Hearsay Test and tagged Fool proof hearsay test, Hearsay, Non-hearsay. Bookmark the permalink. Why can’t all explanations be so simple. You just dumbed it down for this old fart in law school in less than 3 minutes. Thanks!